Oh yes, it’s nearly here. Lucasfilm have marked the three-week countdown to Star Wars: Rogue One by releasing an explosive final trailer. There’s plenty of new footage here to get stuck into: Jyn finally mentions the Death Star by name. As if there needed to be any confirmation that the planet-destroying weapon was, in fact, the iconic superweapon. The ensemble cast also get newly-featured moments. Forest Whittaker’s Saw Gerrera is looking none too pleased that a direct rocket hit barely grazes the behemoth AT-AT standing over him - and there’s also a treat for fans of the Empire as Director Krennic snarls, “I will not fail,” possibly at Darth Vader. Welp. That’s his death sentence well and truly signed off. 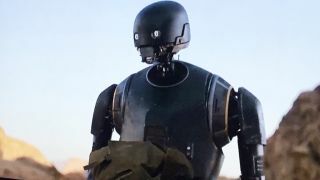 The real star of the trailer, though, is K-2SO. The reprogrammed Imperial security droid is basically a badass C-3PO. “I’ll be there for you… the captain said I had to,” Kaytoo deadpans before, later in the trailer, casually killing a group of Stormtroopers with the most relaxed throw in the history of the galaxy. Expect him to join BB-8 and R2-D2 in the pantheon of amazing robotic Star Wars sidekicks. Directed by Gareth Edwards and starring Felicity Jones, Diego Luna, Ben Mendelsohn, Forest Whitaker, and Mads Mikkelsen, Rogue One: A Star Wars Story is released in the UK on December 15 and the US on December 16.